One of Ms. Worrell's greatest passions is performing art song recitals. She would love to bring an exciting recital to your concert series, church, school, or university. All recitals offer the option of texts and translations in a PowerPoint format for projecting onto a screen to both save on printing costs and also more fully immerse the audience in the musical performance. 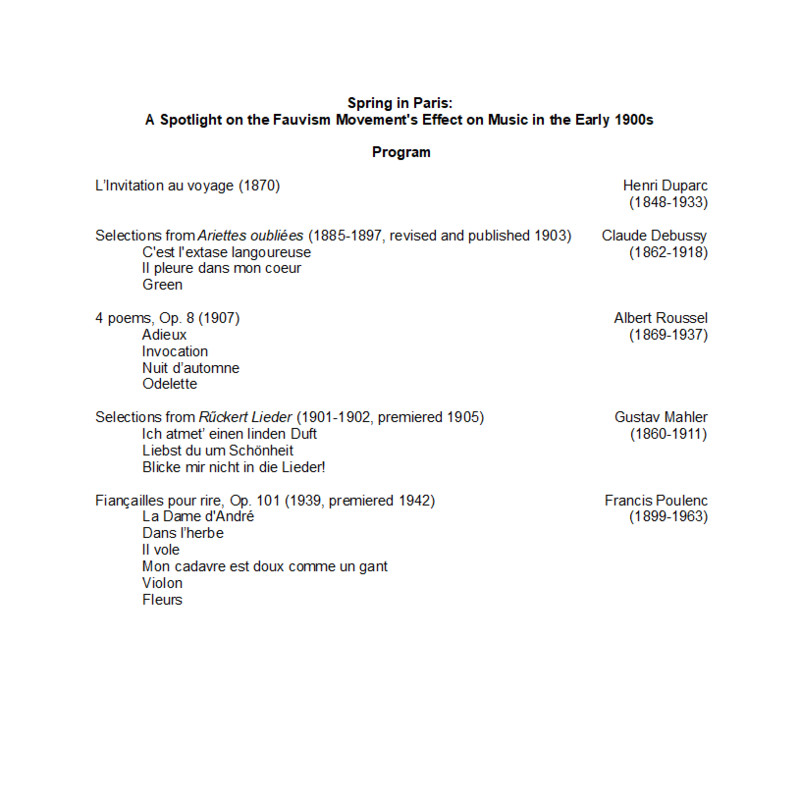 Each recital will feature program notes given directly from the stage. Just a quick email to say once again, how wonderful your performance was on Friday, and how grateful we are for you agreeing to perform at the Ayer Mansion! Ms. Worrell was joined by pianist Mr. Travis Horton when first performing this program as part of the Freeport Memorial Library's Concert Series on March 26, 2017 in Freeport, Long Island, NY. The program was specifically curated to pair with an art lecture on Fauvism that the library was hosting the following week. This program would be a fantastic offering for schools and universities where students are studying art history, French culture, and/or music. Below, please find our sample program. Ms. Worrell first performed this concert dedicated to the works of some of the greatest German and Austrian composers of classical song as part of the Beethoven Society of Melrose's annual concert series in Melrose, MA. She was joined by pianist Mr. Timothy Steele. This program is an excellent musical showcase, and would be appropriate for all lovers of music. It might be of great interest to schools and universities that offer courses in German and music. Below, please find our sample program. Interested in booking Ms. Worrell for a recital performance? If you have questions or would like to request a quote for your concert series, church, school, or university, please reach out directly to Ms. Worrell using the form below. Thank you for your interest in booking a performance of a recital program. I will be getting in touch with you shortly.